The Burmese junta has finally started to allow foreign aid workers some access to the region which took the brunt of last month's cyclone, in the wake of huge international pressure. The decision comes much later than many would have wished. One Burmese volunteer, who had just returned from a remote inlet of the Irrawaddy Delta, told the BBC News website that he found "corpses still hanging" from foliage. "People are still suffering. Help is still needed," he said. Most aid agencies had already been operating in the region before the disaster, through long-established local networks. But it is only now that international staff, with expertise in disaster management crucial for the next phase of operations, have been allowed to deploy there. And even now, the junta's stance on granting access remains inconsistent. Paul Risley from the UN's World Food Programme said that foreign staff, who are logistics and communications experts, had only been given one-day permits to visit the region rather than permission to deploy there. The medical relief charity Merlin is optimistic that it will be able to deploy more international staff, but it acknowledged the process was slow and frustrating. "It would be good to send people experienced in large-scale emergencies who can lead the way and train the national staff to deal with the situation," a spokesperson said. Some aid agencies lost local staff in the cyclone, and the shift in the junta's approach allows organisations to support to their local teams. The Red Cross has identified clean water as an immediate concern. It says that hundreds of thousands of people are still without drinking water. The sea surge that accompanied the cyclone contaminated ponds, wells and other water sources. It is deploying six expatriate Red Cross and Red Crescent water specialists on Wednesday - the first foreign employees of the organisation to get permits to travel beyond Rangoon's city limits since the disaster. The agency had already trained local engineers to operate purification equipment but now the trainers can join their staff in the south. Making contact with the remotest reaches of the delta is a priority. The infrastructure in the south was rudimentary at best before the cyclone, and many roads were simply washed away. The only way of getting aid to some communities is a precarious journey using a traditional wooden boat with an outside motor. But making progress through the intricate maze of rivers, tributaries and streams is proving hard. The rivers twist and wind, and people report that a journey of a few miles can take several hours or a whole day. Merlin flew an experienced emergency maritime co-ordinator, an expert in boats and ships, to Rangoon to co-ordinate the complex task of distributing aid by boats. Local Burmese donors face similar problems. "I went to a place where no aid from the government had reached yet," a Burmese donor from Rangoon told the BBC News website. "The village is two-and-a-half hours downriver using a motorboat from De Da Ye. The situation there is at its worst. Corpses and dead cattle are still there," he said. Another donor said small boats could only carry small amounts of aid and the waves and currents under the small vessels felt treacherous. Like other agencies, Care International has been hiring and purchasing boats. "We are going in very small boats down rivers to small communities of just 20 -40 houses. We have to provide assistance to everyone - not just where the large populations are," said Robert Yellop, head of overseas operations for Care in Australia. There are a number of these small villages isolated on headlands and outcrops, with survivors waiting by river banks for help. While the junta and the international aid community have been wrangling for access, many of these isolated communities have had to fend for themselves. 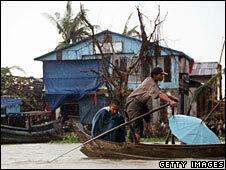 One Burmese private donor described how he discovered distant villages yet to receive help. "Some villages are still left out with no food at all. They are starting to rebuild their houses themselves as they realised that it is difficult to get aid from the government," he said. World Vision's team of international relief specialists who travelled to Ngapudaw last Friday on a needs-assessment mission found villages completely flattened but not without determination. "The tragedy of the impact was etched on their faces but people were already rebuilding with whatever they could find," Steve Goudswaard, World Vision's cyclone response manager, reported. Along with many other agencies, he has identified the next critical phase of assistance for people in the south - giving people the tools and opportunities to rebuild livelihoods. 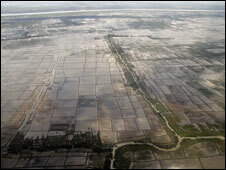 Crops and paddy fields were devastated by the cyclone. Many will need assistance in planting seeds before the end of the season in July. This will help ensure food supply for the year to come. People are focusing on survival but mindful that they once had livelihoods according to Min, a Burmese private donor. "Some people have to walk 10 miles to reach the road and get food from donors. They told me they lost their jobs after Nargis. Now they have no job and are waiting for aid every day."